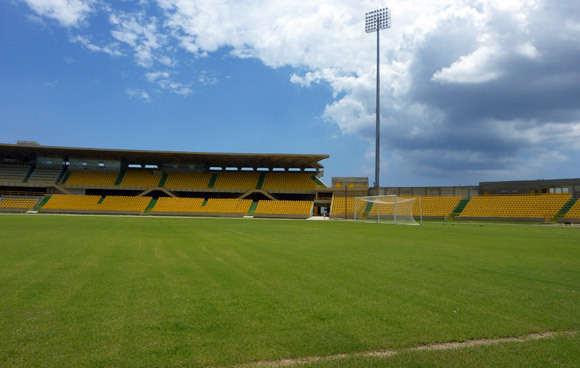 The small, but modern Cartagena stadium Jaime Moron Leon is situated in the East of Cartagena. The stadium takes its name from Jaime Moron Leon, a Cartagena footballer who won two titles with Bogota club Millonarios in 1972 and 1978, finishing top goalscorer on each occasion. He passed away in 2005 and in 2007 it was decided that the stadium would take his name. Until 2007 it was known as Estadio Pedro de Heredia. Estadio Olimpico Jaime Moron Leon was completely refurbished during during 2010 and the first half of 2011 to be ready for the 2011 FIFA Under 20 World Cup which will be held in Colombia. It is an all-seater stadium with a capacity of 17,093. In addition to the instalation of seats, the Cartagena Stadium is now also fitted with modern floodlights, a freshly-laid pitch, an electronic scoreboard as well as plush new facilities for spectators, players and press. The refurbished Jaime Moron Leon stadium was inaugurated in April 2011 with a friendly match played between local team Real Cartagena and Real Mallorca of Spain. The stadium is coloured yellow and green, the colours of the Cartagena flag. The main stand is Occidental (Western) that houses the press box and most expensive seating, as well as player changing rooms. The Oriental (Eastern) stand is large a two-tier stand that receives the sun late afternoon. The cheapest stands are Norte (North) and Sur (South). The Sur stand is home to local side Real Cartagena's fanatical following. The Norte stand takes the visiting supporters. The stadium can be reached from the historic centre by bus, taxi, or the soon(ish) to be opened Trans Caribe system. 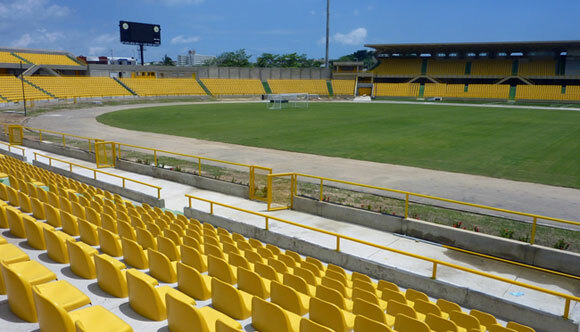 Take any bus heading along the main highway called Pedro de Heredia on which the stadium sits. A taxi from the historic centre will cost about 8,000 pesos. The Trans Caribe bus system (in the style of Bogota's Transmilenio system) was opened at the end of 2011. There is a stop along Pedro de Heredia right outside the stadium. The area around the stadium is not the most salubrious so try to limit loitering around waiting for buses etc. The Estadio Jaime Moron Leon is located in a sports zone which includes the Baseball stadium and the attractive Plaza de Toros (Bull Ring). The Plaza de Toros is a wooden structure in the form of a crown. Read the main guide to cartagena for info on attractions, hotels and more.